Lake Lyndon B. Johnson (or Lake LBJ, also known as Alvin J. Wirtz Dam) is located four miles west of Marble Falls in Burnet and Llano counties, Texas, on the Colorado River. The dam originally called Granite Shoals Dam was renamed Wirtz Dam in 1952 for Alvin J. Wirtz, the first general counsel of the Lower Colorado River Authority. The reservoir, formerly known as Granite Shoals Lake, was renamed on April 22, 1965, for President Lyndon B Johnson "in gratitude for his work as United States Congressman and Senator toward the development of the project." The project was authorized by Permit No. 953 dated May 15, 1926 from the State Board of Water Engineers. 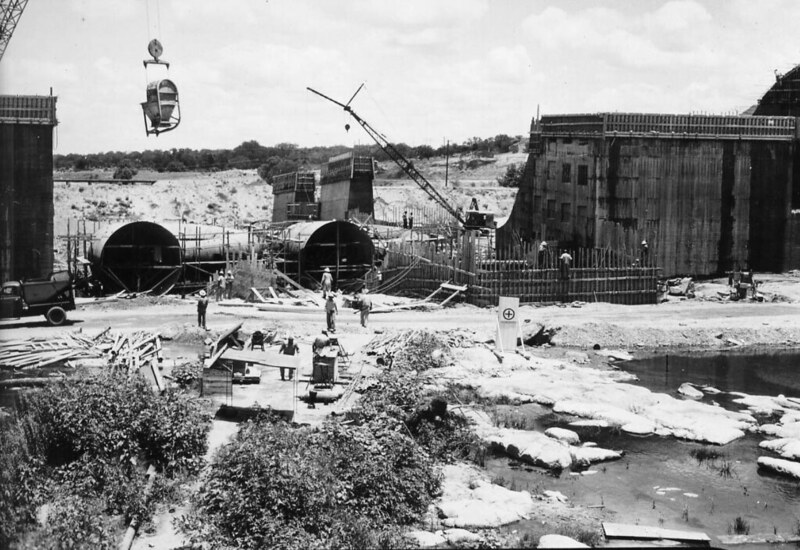 Construction on Wirtz Dam started in September 1948 and was completed in November 1951. Deliberate impoundment of water began in May 1951. The project is owned and operated by the Lower Colorado River Authority and is used primarily to generate hydroelectric power. The dam is a concrete and earthfill structure of 5,491 feet long with a maximum height of 118.29 feet. The top of the dam is at an elevation of 838 feet above mean sea level. Designed 100 year flood state is 828.1 feet above mean sea level. Spillway is controlled by 9 tainter gates, each 50 feet wide and 30 feet high, with the crest at elevation, 796 feet above mean sea level. The idea of the Highland Lakes chain originated in the mid-19th century. The credit for the idea of a dam on the Colorado may go to Adam Rankin Johnson, a farmer and entrepreneur who established the city of Marble Falls. In 1854 he marked an “X” at a location where one of the dams should be built. It was not uncommon for the bankruptcy of dam builders to result in the creation of the LCRA. In the 1920s, catastrophic floods across the United States, coupled with the construction of massive Boulder Dam in the West, increased national interest in dam projects that coupled hydroelectric power generation with flood control. That led to one utility company in 1931, which had purchased Alexander’s rights, to begin building a massive structure on the Colorado at the location marked by Johnson. But a year later, less than halfway through construction, the company went bankrupt, a victim of the Great Depression and corporate mismanagement. The top of the gates is at elevation, 826 feet above mean sea level. However, the operating water level is maintained at around 825.4 feet above mean sea level, since the river flow is determined by the controlled discharge of the Lake Buchanan and Inks Lake plants upstream on the Colorado River, plus the entire unregulated flow from the Llano River. According to 2007 TWDB survey, the reservoir has a capacity of 133,090 acre-feet and a surface area of 6,273 acres at an operating elevation of 825.68 feet above mean sea level. The drainage area of the lake is 36,290 square miles, of which 11,900 are noncontributing. According to Lower Colorado River Authority, record high of water level is 836.2 feet above mean sea level on September 11, 1952. In the 1920s, catastrophic floods across the United States, coupled with the construction of massive Boulder Dam in the West, increased national interest in dam projects that coupled hydroelectric power generation with flood control. One utility company that had purchased Alexander’s rights began building a massive structure on the Colorado. But just a year later, less than halfway through construction, the company went bankrupt, a victim of the Great Depression and corporate mismanagement.